From its original home at Australia’s sporting soul - The Melbourne Cricket Ground - to its limited edition collectability, every detail in the Ponsford Pen combines rare history with meticulous handcrafted composition. As you begin to make your lists and have to decide what to get everyone this holiday season, there is always one - one special person who takes as much time to shop for as everyone else combined..
Finding the perfect gift requires so much more effort. And the worst part is - more often than not - this is the most important person you must buy for. Your partner, your father, your son (perhaps even a key business stakeholder). But what do you get someone who already has everything? How do you find that breathtaking, never-to-be-forgotten, gift they will use every single day... a gift that will make them smile and feel the warmth you gave each time they use it... a gift that will be treasured for a lifetime? Well, you can give that special someone exactly that - An Authentic Piece of Australian Sporting History - A handcrafted piece of the Melbourne Cricket Ground. The MCG’s history has so many stories to tell, it’s only fitting that the little remaining Ponsford Stand Timber that was able to be saved from the wreckers, is used so you can tell your story. That’s why we’re introducing a very small series of our hand-crafted, executive-style rollerball pens, crafted exclusively from the timber that once was the Ponsford Stand. The Ponsford Pen is stylish and functional. It’s a limited edition collectible that you can use every day. You’ll be the talking point in meetings and the envy of your friends. Keep it for yourself or gift it as the most memorable present – there’s just something about owning a piece of the past that appeals to everyone, and the Ponsford Pen doesn’t just preserve a piece of history, it’s usable too. Let me tell you a little about the journey from Ponsford Stand to Ponsford Pen. I wasn’t about to hand the timber that I saved from the wreckers over to any old pen-maker. I wanted to make sure it went to a craftsman, someone with history (just like the stand itself! ), someone who loves the feel of timber and wants to bring it to life. After quite a bit of searching I found exactly the right craftsman, someone who has been making timber pens in Australia for over 25 years. I’m not sure if it was a sign, but when I found out his name was Rob Wood I knew I was at the right place! Rob practices his craft using the Symtec creative wood turning system. No longer manufactured, Symtec wood lathes were invented and first produced in Adelaide nearly 30 years ago. Somehow it seems fitting that the pens are being turned on machinery that itself has a precious past. Each pen is individually hand-crafted by Rob and lovingly fitted with a rollerball ink cartridge to produce a sleek and sophisticated pen that is rich with history. Designed in the fashion of the classic Junior Gentleman’s Rollerball writing instruments, no two authentic Ponsford Stand Timber Pens are the same. The distinctive patterns in the grain and subtle shades of colour make each pen completely unique. The 100% authentic Ponsford Stand Timber Pen is bigger than a standard slimline twist pen, it writes more smoothly and the cartridge holds more ink. In a world of mass produced, overly manufactured goods, just imagine holding your own beautifully crafted and polished Ponsford timber wooden rollerball pen! Larger than a standard slimline twist pen, it writes more smoothly and the easy-to-replace cartridge holds more ink – simply unscrew, remove and insert a new cartridge. The refill is a standard size and will accommodate most standard rollerball refills, which means you’ve got a writing instrument that will last lifetime. You, or the recipient, will adore the rollerball style because it combines the convenience of a ballpoint with the beautiful wet ink feel of a fountain pen. It uses a ball-shaped writing tip with water-based liquid or gelled ink, which is very different to the thick, oil-based ink found in a ballpoint pen. The thinner ink gives the rollerball pen its particularly smooth and distinctive writing qualities – something you will instantly feel each and every time you pick up your Ponsford Pen to write. To ensure the lifetime value and quality each pen comes in its own collector’s case – an elegant wooden box which has been meticulously crafted and features a glass display top. Your collector’s case will keep your pen looking as good as new and is a fitting home for such a historic piece. Imagine how that would look, taking pride of place on your office desk or coffee table! If it’s a talking point or unforgettable gift with a difference that you’re looking for, this is it. The Ponsford Pen is styled to surprise your senses, designed to fuel your imagination, crafted to delight your creativity and conceived to resonate with Australian sporting legends. Also included with your Ponsford Pen is a personally signed, wax-stamped certificate of authenticity – highlighting its unique number in the limited edition series, so you know you’re getting the genuine piece of sporting memorabilia. Whether it’s handed down from generation to generation, or sold as a collector's item in the future, this remarkable, limited edition collectible will be highly sought-after – and only increase in value each and every year. What would you expect to pay for a piece of Australia’s sporting history? You can pay hundreds or even thousands of dollars for a Montblanc, Waterman or Cross pen – but all you’re really buying is some resin and a brand name. In fact, one exorbitant ballpoint pen currently selling for over $2970 is made from nothing more than old wine barrels – nothing remarkable or extraordinary like the Melbourne Cricket Ground. 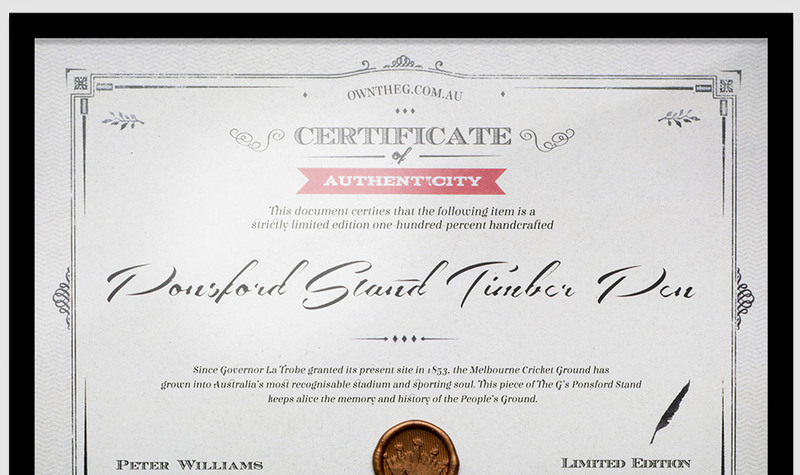 With our 100% authentic Ponsford Pen you get a piece of Australian sporting history, you get genuine Ponsford Stand timber that feels alive with memories. You get a small part of the spiritual home of Australian sport. You get a pen made from timber that was erected at the MCG in 1966 - nearly half a century ago. All of this combines to produce a collectable pen that can only increase in value as time goes by. If stocks last and we decide to release these pens to the general retail public, you can expect to pay at least $500 at a prestige pen merchant. Until then, there is no middle-man retailer, and therefore I can pass those savings directly onto you. Don’t risk paying 50% more in retail outlets, or worse yet missing out altogether due to the strictly limited number of pens being created (500 Only). So to secure your own limited edition Ponsford Pen for the early release price of only $523 $327, click here to complete your order. Not only does this price include the handcrafted Pen itself, its glass top display case, and a personally signed + numbered certificate of authenticity, delivery to your door is also included - with postal insurance to the value of $500. Plus, because you’re buying directly, and I’m so sure you’ll absolutely love your Ponsford Pen – I’m offering a full no questions asked, 12-month money-back guarantee. So if for any reason whatsoever you are no longer happy with your Ponsford Pen, simply return it (in resellable condition) and I will immediately refund every cent. I’ll even cover the return postage. 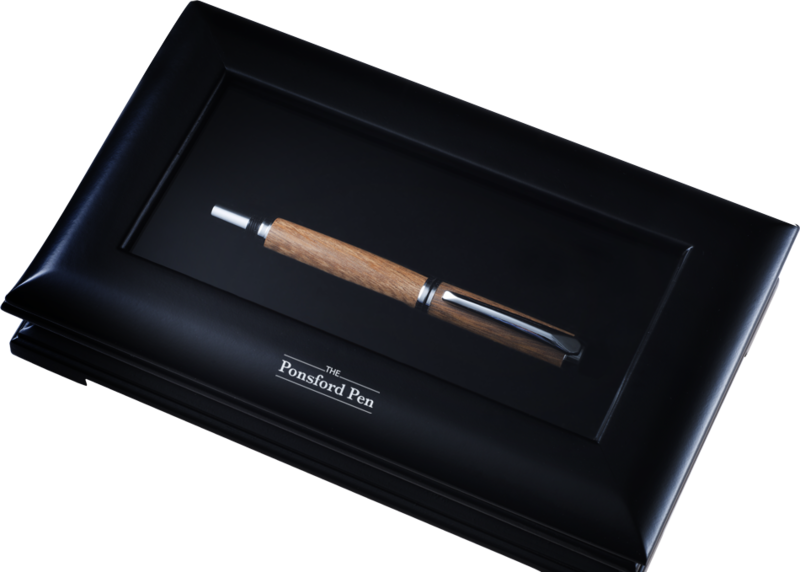 To secure this piece of history for only $327, just click the button below to complete the order and your pen made from 100% authentic Ponsford Stand timber will be carefully packed and shipped to you within the next 48 hours.